USS Indiana was the class leader and the first numbered battleship. The hull is fiberglass and I got it on E-Bay. Other materials used were wood, styrene, brass, and aluminum. 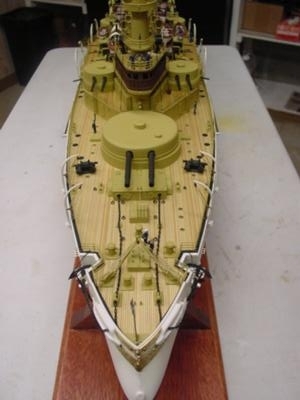 Fittings which were not scratch-built came from Blue Jacket and Plastruct. 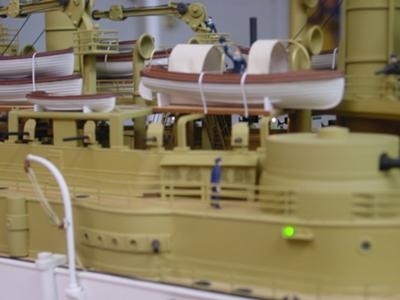 Small boats came from Model Dockyard in the U.K. Plans were from Loyalhanna dockyard. Photos and additional info came from American Steel Navy, by CDR.John D. Alden, USN (ret). 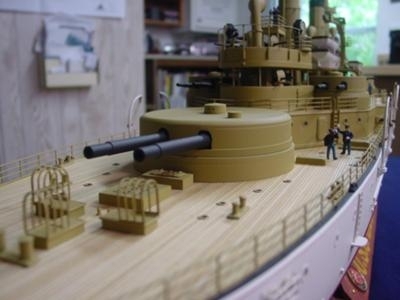 The ship is built to 1/96 scale and has a sound card for the main battery. 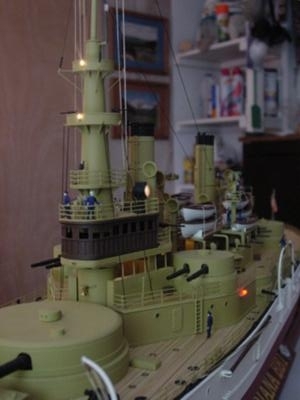 Also has port and starboard lighting. Mast lights, search lights, and lights under the flying deck. The RC unit is 4-channel and the main battery is 12VDC. The ship saw action at the battle of Santiago, Cuba on July 3,1898. The ship was launched on Feb.28, 1893 and commissioned on Nov. 20,1895. 6x1 " " " "